Menus, attachables, ammo and more! It’s been a productive couple weeks! I’ve been focusing primarily on 4.0 and making a ton of progress. Once again a disclaimer upfront: Most of these assets are placeholder and/or work-in-progress and nothing’s off the table to improve. Keeping that in mind please share your feedback and suggestions! The main menu is now functional with everything you’d expect like key bindings, graphics options, sensitivity – all of which are configurable in-game as well. With this working I was able to do the first standalone local multiplayer test, and everything is comping along really nicely. I’m aiming to have the first online multiplayer testing available similarly to Operation Mapleleaf sometime in the next few weeks as well! 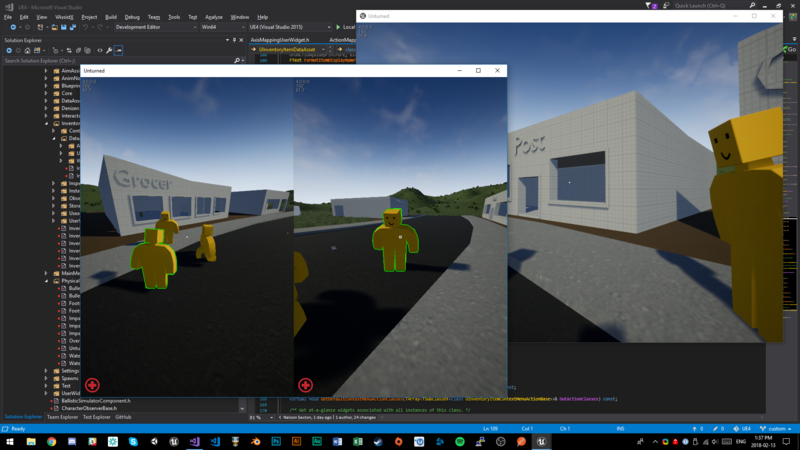 I also started on the first performance pass of 4 starting to make sure only the most essential assets are kept in memory. In 3 this is why it takes so long to load the game into the main menu: you have to load all of the items, vehicles, etc at startup which wastes a lot of memory, whereas in 4 I’m streaming as much in and out as possible. I’ve seen a lot of feedback around performance with the new improved visual styles, and I think I can safely say: don’t worry. My goal is to have improved performance over 3 while still supporting superior graphics. I feel I’ve learned a lot from the development of 3 in this regard which will really benefit 4. There’s a lot of neat possibilities here: you can now locally host servers with the click of a button from the main menu (dedicated servers are still supported too of course!) while in splitscreen – the host here is playing in splitscreen with a keyboard and xbox controller plugged in, and the window on the right has connected to their server locally. 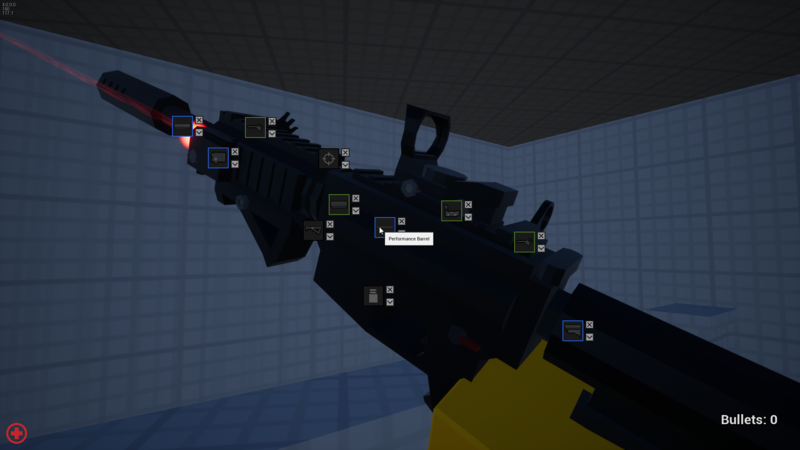 I’ve seen your feedback and I’m really excited to have both the attachments view (user interface is work-in-progress at this point) back in-game, but to have done a lot of upgrades to the attachments system over the past couple weeks now allowing these very modular firearms. There are several features at work here now allowing branching attachments from receiver models, rail systems (Picatinny on the Eaglefire) and calibers. I’ve also taken conversion mounts into account with this, so you for example could install an adapter on your upper receiver to allow attaching Russian optics. I think this will open up some really interesting customization/personalization options, and steer away from the “objectively best” combinations of attachments. Survival wise this will also help increase gun rarity by splitting up parts (up for discussion/debate) alongside different receiver models for different tiers (i.e. singlefire-only civilian Eaglefire variant), and some parts can potentially require maintenance – I’m not entirely sure on where to take this mechanic though as gun durability is frustrating in 3. These new features are also very modular down to the level of putting batteries into flashlights, bait onto a fishing rod hook or fuel into a chainsaw. There’s still some work to be done here making it more user friendly, but I’ve made some huge progress on stackable items and ammunition. Rather than filling your inventory with a dozen 1×1 crafting materials you can stack them to a reasonable limit, and this includes all the features you would expect like splitting stacks into two (brings up a slider for how many to transfer) or dragging one onto another to stack them. 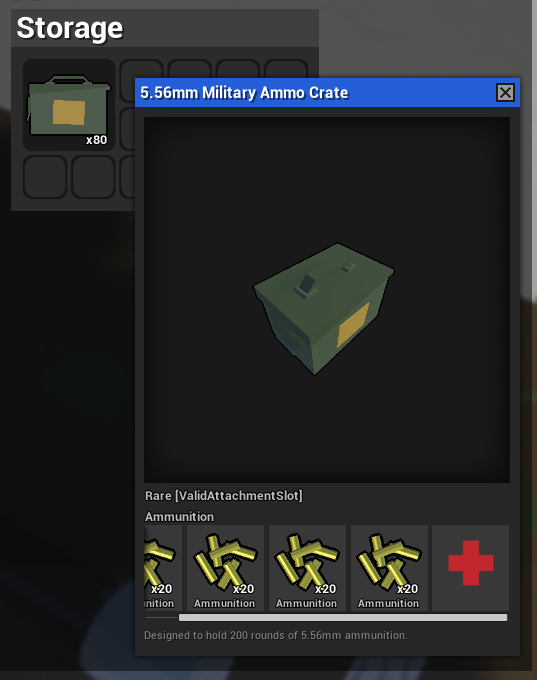 Along with this the attachments now support multiple items in a slot, so for magazines and ammo containers you can drag/drop bullets into them. Further along the road this will also allow you re-order different bullets in the magazine like some tracers at the end to alert you that you’re running out. With the next post we should be a lot closer to the first stable testable version of the game!